I wrote some weeks ago that the government was going to use Mid Staffs as a template in entirely the wrong way. The unquestioned problems with poor care in 3 wards (out of many) at Stafford hospital have been addressed and the Care Quality Commission (CQC) has inspected the hospital twice in the space of 9 months and found that it was meeting all required standards. The obvious conclusion for a genuinely pro-NHS government would be to use Mid Staffs as a model for how to turn a struggling hospital around, and use the lessons learned to do the same at others. Instead, having created and nurtured the myth that hundreds of people died ‘needlessly’ at Stafford hospital to erode public affection for the broader NHS, the government chose to put the hospital into administration and appoint a team of ‘independent’ administrators to decide how to break up its services – the same people who had come up with the original plan to close it and share its patients among other over-stretched hospitals. Jeremy Hunt’s recent speech in response to the Francis Report completely ignored the most important, and most often repeated, conclusion of the report – that understaffing was the cause of poor care. Instead, he announced unrealistic measures to disguise his real purpose: setting up hospitals to fail – and then putting struggling hospitals into ‘failure regimes’ designed to lead to their closure. The government had already targeted 14 hospitals for ‘special measures’ for supposed similarities to Stafford’s ‘HSMR’ mortality statistics – statistics based on data so deeply flawed that last year 17,000 episodes of obstetric (pregnancy) treatments were supposedly given to men – 10% of Englands NHS hospitals. But the government is in a hurry to pull down as much of the NHS as it can before the next election, and the scope of its ambition is staggering. The Guardian has revealed that no less than 50 English hospitals – 36% of the total – are being targeted for lengthy ‘special investigations’ because of supposed ’cause for concern over care standards’. And that’s just the ‘first wave’ of inspections under Hunt’s new hatchet man Chief Inspector of Hospitals. The unseemly rush is clearly on – the Tories don’t expect to be in government after the next election, and its front bench is absolutely intent on dismantling as much as the NHS as it can in the two years remaining before the next general election. 40,000 or more Stafford people are expected to take to the streets on Saturday in spite of expected high winds and rain, to campaign to keep the hospital they love and value open. They know that a ‘hatchet job’ has been done to bring their hospital to the brink of extinction, and they’re not fooled. If you can get there, why not support them and join the march? They have a Facebook page where you can find out more. Please join if you can – it could be your hospital next. Visit CCGWatch.org.uk to find out about other threats to the NHS as a public service – and consider donating to the effort. The CCGWatch founding principles apply just as much to the attacks by Monitor and the Dept of Health on hospitals as they do to the activities of CCGs, and because CCGWatch aims to honour the principle of the NHS and provide its assistance ‘free at the point of need’, it urgently needs funds for the effort. Find out what’s happening in your area – whether to your local hospital or to other health services. The local offices of the health unions (Unite, GMB, Unison) would be a good starting point – ask them for an update. Use the FOI Act. 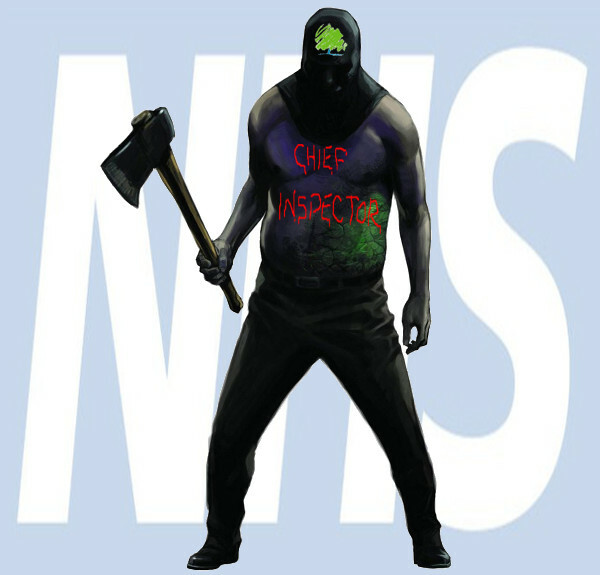 Darkness is a friend to those who want to chip (or chop) away at our NHS services. Put in Freedom of Information requests to your local hospital and CCG to find out what’s happening and what is being planned. You can easily submit and monitor FOI requests via whatdotheyknow.com. Write to your MP – of whichever party – and demand that they do everything to protect NHS services locally and nationally. Don’t be fobbed off with platitudes – ask for specifics about what they are doing, and challenge anything you don’t like or which seems like lip-service. There will be many, many ways to get involved that I don’t know about. Find out what’s happening in your area, and just jump in! You’ll get to know lots of great people, and you’ll become what this government fears the most – an informed citizen prepared to make noise and take action. Sufficient action and public disquiet may make the government listen to the very cogent and sensible arguments. Lets hope so. After all, provision of good local services is what local people want and need – and are prepared to pay for. Indeed. But the many of the richest all over the country feel they could save a lot of money by getting rid of the national health service so they’re not paying to help everyone else. That mindset from those who are at the least extremely comfortable is inexcusable. Amen to that. Unbelievable that the fortunate and well off don’t want to be proportionate risk sharers. Annoys me nearly as much as the super rich who say they’ve worked hard for it (hence entitled to employ clever accountants) as if care workers and floor cleaners who work their socks off in unsocial hours haven’t done pretty much the same. The amazing thing is that the low paid are actually quite content for people to be paid up to 20 times their salary for long training, very responsible and onerous jobs (which is why the CEO of the John Lewis Partnership is paid 20 times the lowest paid worker apparently) – but these people (rightly) resent the obscene and ludicrous multiples and tax avoidance that amounts to taking the ………. Arghhh! NEWS: More than 30,000 people turned out for “Support Stafford Hospital” march. Must be one of the largest ever outside London or large conurbations. So many people it took 2 hours for everyone to leave the market square area and walk the mile to Stafford Hospital. Real community feel, all ages, all parts of the political/religious etc spectrum represented. Messages of support from Stoke, Wolverhampton. Burton, Walsall, Shropshire. People happy, jolly, supportive but determined. Democracy at work? Express & Star say 40,000! What may not be mentioned is the effect on staff morale. For the first time in years they have been allowed out of the undergrowth to say they are proud of doing a good job. To feel such huge support from the ordinary people of Stafford and surrounding areas must have such a huge boost. This can only be good for their patients – Stafford is already recovered to the extent of being one of the best DGHs – what an opportunity for the NHS to learn! Could we yet have a quality-led NHS?